Google “VR” today and you’ll get almost 1.5 billion hits, mostly to do with headsets and goggles. With the appearance of VR, a new era of entertainment and immersion has begun – an age in which the user finds themselves a participant in the content being screened, rather than just a viewer. But even with all the benefits of new technology, headset VR has one big disadvantage: it is a personal experience that cannot be shared in a group. The answer? VR Dome. Laduma VR is a virtual reality (VR) and augmented reality (AR) company. The company wanted a marketing tool for business events and expos to present their product to large groups of people simultaneously. Once they had the idea, they asked Fulldome.pro to engineer such a solution. So what is VR Dome? 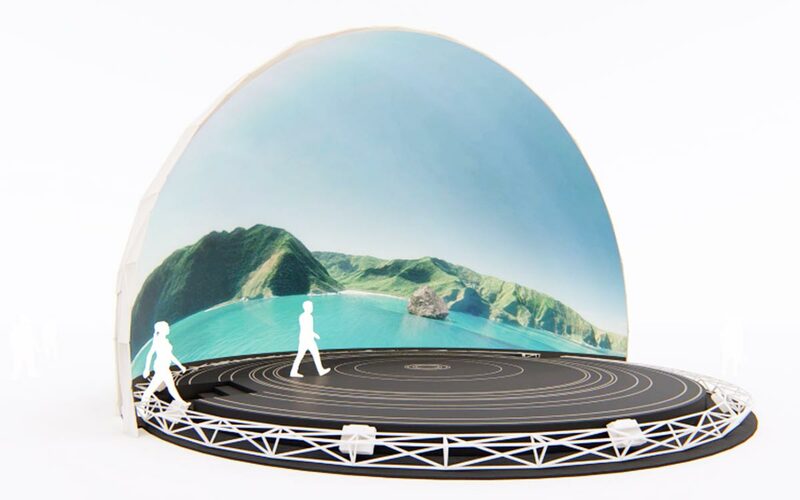 Fulldome.pro has created a geodesic projection dome with a low screen line. While the screen usually starts at a height of one meter from the floor, in the VR Dome it starts at a height of just 40 centimeters. As a result, there is a 25% larger projection area in comparison to a standard 360 projection dome. This innovation means floor-to-floor projection, giving dome visitors a fully immersive experience, without any headsets or goggles. Of course, an unusual type of screen like this needs a different type of projection. To allow people to move around the dome without casting shadows on the screen, our IT specialists set up the projectors to project almost vertically. – Iurii Domkin, IT specialist.